Getting out of the sacristies and going to the people! | Walk with us! Getting out of the sacristies and going to the people! 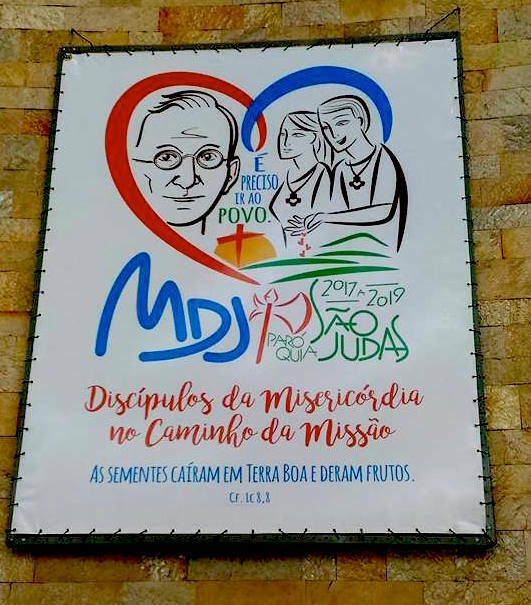 The first phase of the Youth Dehonian Mission (M.D.J) took place from January 13-22 in Terra Boa, Parana, in Brazil. 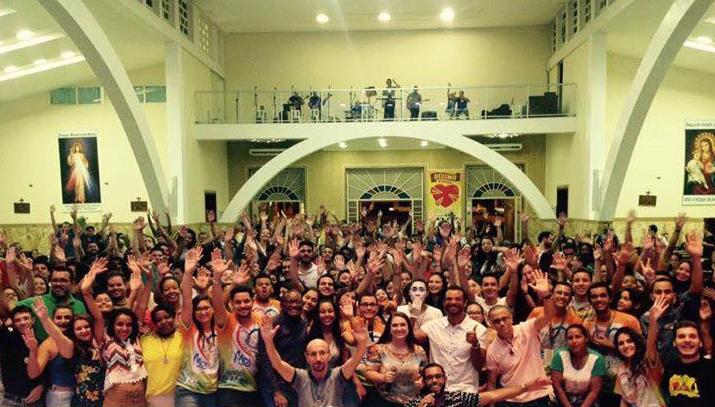 Every three years a different city is selected to be the host city of the Brazil Youth Dehonian Missionaries. 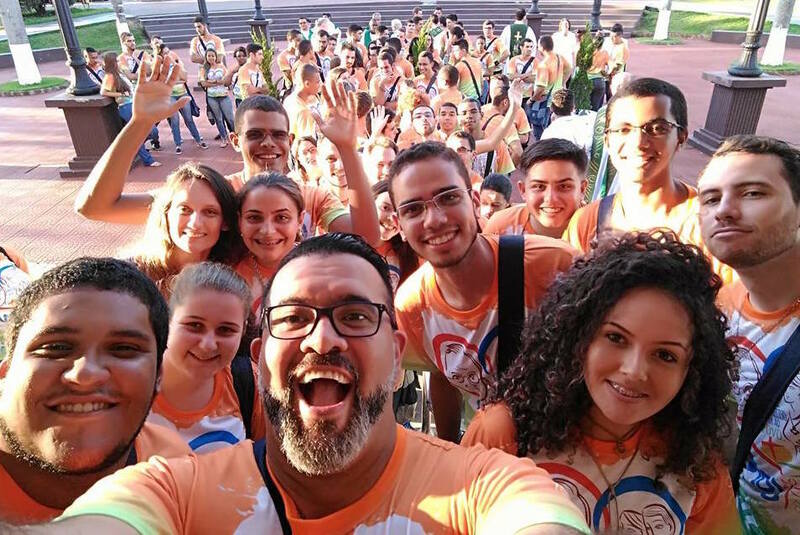 In 2017 the mission began in Terra Boa with 122 participants including priests, fraters (seminarians) and young lay Dehonians. Divided into nine communities of mission in different areas of the city we visited many houses to share stories, ideas, and the Word of God. What an incredible experience it was to see the young Dehonians who had so much enthusiasm in their heart for this experience. In the same way, the people of Terra Boa were expecting our visits. The weather was very hot, but that did not stop us from our mission. Entering each house was like opening a book and each page brought something completely different and new. We met really humble people who opened not just the doors of their homes but their hearts to us as they shared with us their feelings. To my surprise and joy, in one of the many houses that I visited I had the opportunity to meet and get to know a Buddhist family. I was impressed by the way they spoke about Catholics and even more how they spoke about Fr. Leo John Dehon. I was amazed by their knowledge about our founder as well as their love for Pope Francis. Furthermore, to make this experience even greater, I was invited to light incense as an offering to their ancestors. “My ancestors are going to be very happy with your presence and offering,” they said to us. This is how this mission also gave me an intercultural and inter-religious experience that taught me again to be more respectful and understanding of other cultures and religions. And that is what Pope Francis is doing by inviting us to engage in inter-cultural and religious dialogue with other people and faiths. I was called to be part of this mission to awaken and nourish my missionary vocation. I was called to be a disciple and plant seeds in this soil so they could to produce good fruit. I cannot say enough about the beautiful devotion to Our Lady of Aparecida here in Brazil, It was really wonderful to be present to pray the Rosary with a big group of men who every week gather to pray the Rosary. A total of 345 men gathered that day, and everyone came with an open heart and dedication to pray together. However, during our mission, a dark and sad cloud covered the shining sun. Two of the members of the mission lost members of their families in a car accident. One of them, Danillo, who was part of my group doing visits, lost his father. It was a horrible experience for him and all of us. We tried to be present for him and we cried with him while gathering him into a big hug to show our love and support for him. The next day we also accompanied him and his family to the funeral. It was a sad situation. But I felt blessed again to be present for him in that moment and to witness how beautiful and powerful the human heart can be when we really understand and share the pain of others. Continuing with these great experiences, we celebrated Mass with young people in the area. There was a huge crowd of young people who sang and danced to show their love to God. Learning the steps was not easy, but I did my best and I sang and danced along with them. I was even able to use what I learned years ago when I did some theater. I was invited to take a small part in a skit that we were going to present to the young people before Mass. I have to say that I was nervous, but the experience was super nice. When the day came to say good bye to the people of Terra Boa there were many tears –– tears of joy, tears of satisfaction for our mission, tears of gratitude, and tears of sadness for leaving that place and the many friends we made. Fr. Dehon taught us to get out of the sacristy and go to the people and Pope Francis has invited us to do the same thing. That invitation has a more powerful meaning in my heart now. We Dehonians understand the needs and suffering of others and we go to the people when they need us. But when I say Dehonians I include lay Dehonians who also understand the meaning of that invitation. And it was reflected not just in the young Dehonians but also in the many lay Dehonians who accompanied us during our days in Terra Boa. My words of gratitude extend to the many people who were present and willing to give their time and dedication so we would have a place to stay and food to eat. What a blessed experience it was. I can truly say my heart rejoiced in it and my vocation continues to grow each day. We have all been called to be present to others in many different ways, not only to show care and respect to people but to show the face of God to others and to be able to also see the face of God them. I was able to put in practice some of the pastoral skills that I have been learning. But it was also a great opportunity to learn even more about myself and learn more about how to be present to others and see the face of God in them. I heard many times during our visits that our presence was a blessing for them. But my response was that they were a blessing to me because all the people I visited were a blessing to me on my journey and to my vocation. With all due respect, this experience actually taught us something that we could not learn in any classroom: how to reach out to people and really understand the meaning of getting out of the sacristy. We learned the theory of how to reach out to people in the classroom but this experience really taught us the reality of reaching out to others. Muito Obrigado! Thank you so much Terra Boa, thank you to the missionaries and thank you God for your calling to live this experience of being Dehonian. This entry was posted in Frater Juan Carlos Castañeda Rojas and tagged Dehonians, mission, Priests of the Sacred Heart, SCJs, vocation. Bookmark the permalink.